Camera: Nikon D4 | Exposure time: 1/500s | Aperture: F6.3 | ISO speed: 1000 | Lens: 70-200mm zoom. This was taken from the media centre while Fernando Alonso signed autographs for fans on Thursday. It’s nice to get a different angle rather than just being up close with every shot, and in this you get an idea of how many people deep the crowd is. Alonso had started signing at one end and Raikkonen had started at the other and when they got to the middle, Raikkonen just buggered off because all the fans were clamouring for Alonso! 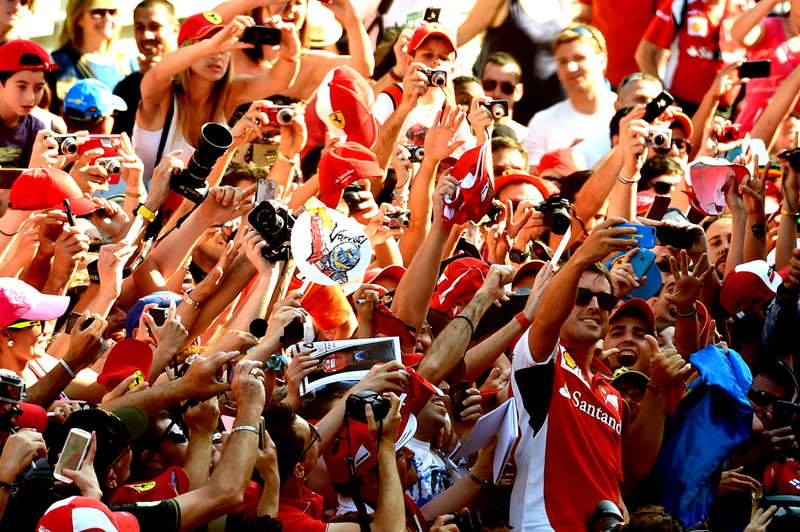 Fernando kept going to the end and always does this selfie thing now with all his fans. He doesn’t seemed concerned that they pull him and touch him, and I saw the picture that he took and it’s actually quite a good picture! Camera: Nikon D4 | Exposure time: 1/1600s | Aperture: F16 | ISO speed: 1000 | Lens: 500mm telephoto. 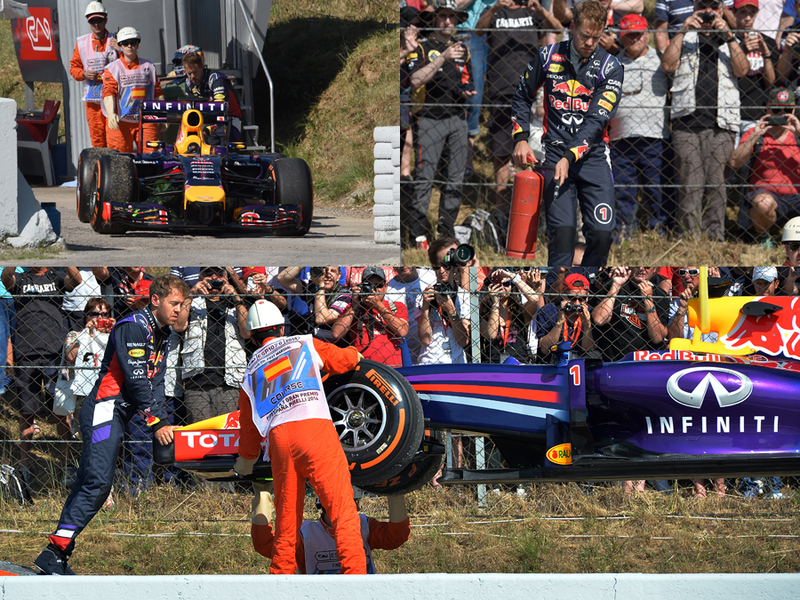 This was after Sebastian Vettel’s break down in second practice. I was in the pits when it happened but saw it on the screen and realised that it wasn’t that far away. I literally ran down the slip road, turned right and he was just on the other side. I could see the helicopter hanging overhead so I knew it was the right spot, and by the time I got there he was already out the car and around the back with a fire extinguisher. He then helped level the car as it was put on the truck and when it got on the truck he had another look round the back with the fire extinguisher and also appeared to give it a squirt in the cockpit. It’s a good set of pictures and the problem turned out to be one of Friday’s biggest stories as it meant he couldn’t go back out in FP2. Camera: Nikon D4 | Exposure time: 1/40s | Aperture: F20 | Lens: 500mm telephoto. 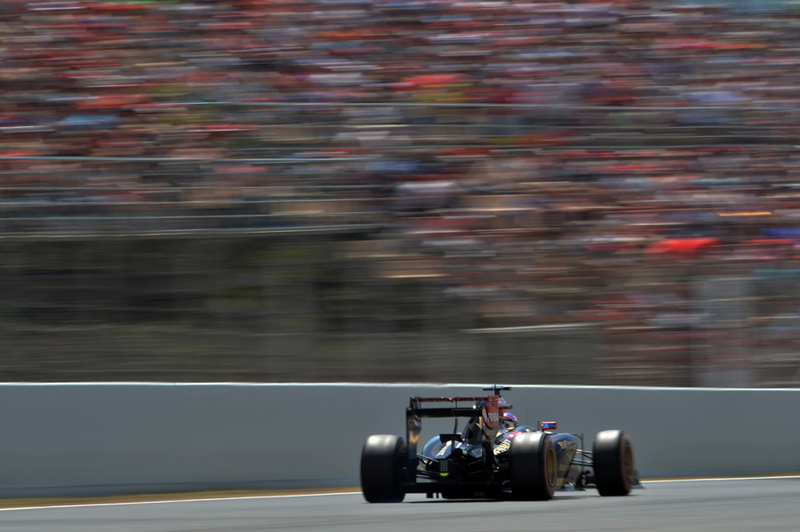 This is taken on the start-finish straight, so it’s the fastest part of the track and they are nearing 200mph there. What I tend to do is take a shot with the scoreboard tower in it as the cars come out the pits, but once you have one of every car there’s not a lot more you can do. So I tend to pan the cars down the track on a slow shutter speed, which can be a bit hit and miss, although experience helps to keep it sharp. It makes a really clean photo with the track, the car and the crowd. It’s a bit of blur and a bit of speed, so I like it. Camera: Nikon D4 | Exposure time: 1/250s | Aperture: F22 | ISO speed: 400 | Lens: 24-70mm zoom. 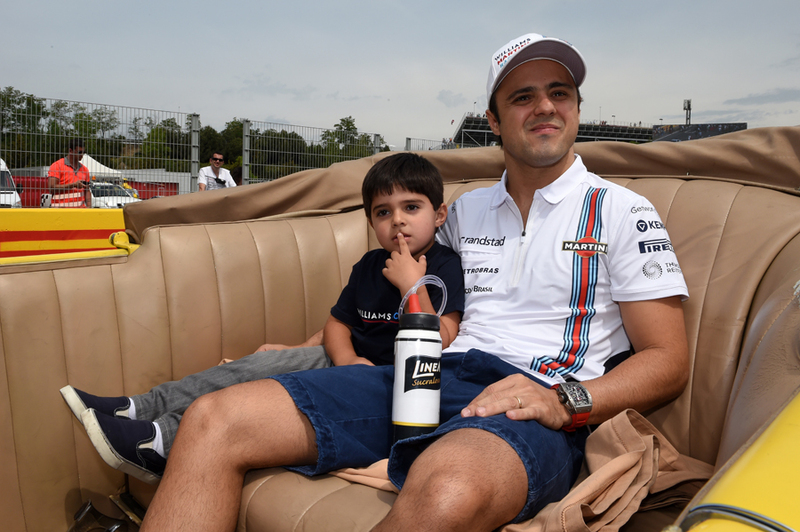 It was great to see Felipe Massa take his kid on the drivers’ parade. It’s almost like he thinks it’s his last year and he wants to share it, although I don’t actually know how long his contract is. Maybe it’s a South American thing, because Pastor Maldonado often brings his little baby to the paddock, and they are quite open about parading them around the paddock. Juan Pablo Montoya used to bring his little boy, and I remember getting a photo of him sat on a little golf cart one weekend. The Europeans are different, Michael Schumacher, for example, never brought his kids and even Alonso walked in with his girlfriend but they weren’t holding hands. But it’s great to see Felipe carrying his boy on his shoulders through the paddock and showing him what F1 is like. Camera: Nikon D4 | Exposure time: 1/250s | Aperture: F10 | ISO speed: 200 | Lens: 24-70mm zoom. 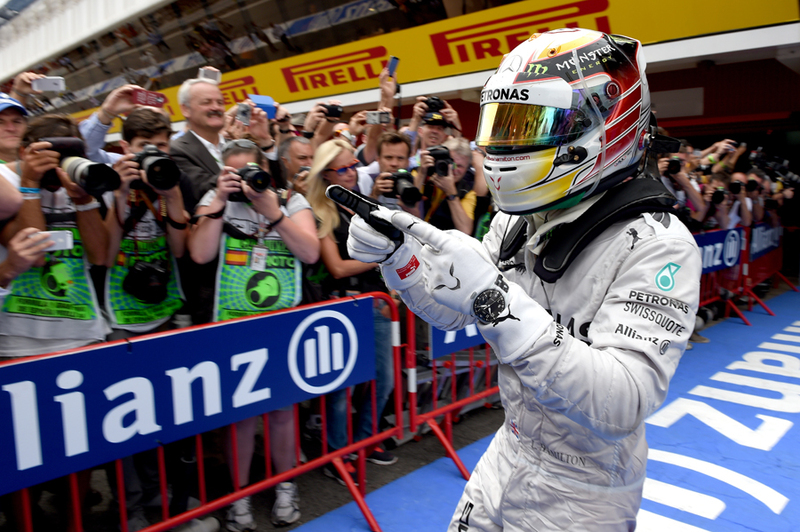 This was taken as Lewis Hamilton jumped out of the car and headed straight for Dieter Zetsche. He was pointing at him and then went to hug him and I was right there and so close that I got on TV at that point. I was actually there to position myself for the podium, but I got this good spot in parc ferme first and got a really good set of pictures. There was a bit of luck, because you can always be in the wrong spot with the wrong lens, but this time I did quite well. Camera: Nikon D4 | Exposure time: 1/320s | Aperture: F5.6 | ISO speed: 500 | Lens: 500mm telephoto. This was another shot taken out of the media centre window, and that almost makes me sound quite lazy because I was shooting out the window, but actually it offered a nice angle. There was no point in me going down to the pit lane because one of our photographers, Patrick, you can see down there lying on the floor for one angle and we had another, Luca, doing the head-on shot. 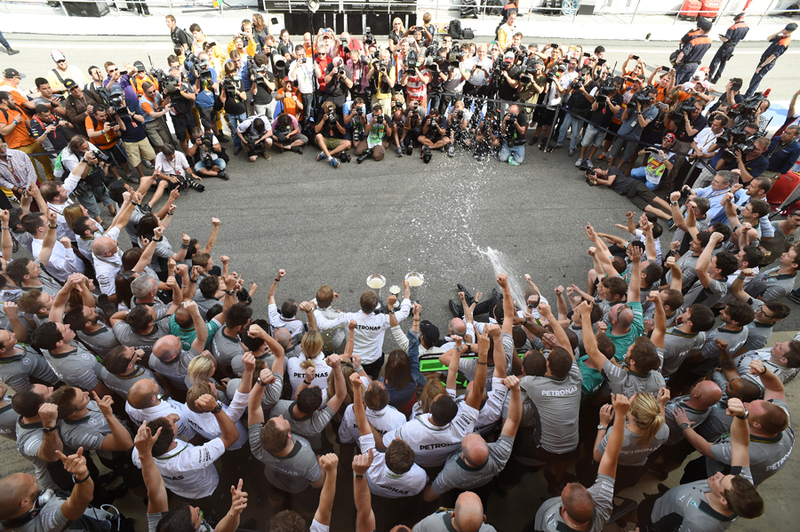 We had it covered from every angle and it’s nice here how you see the team celebrating and the media attention its created with the bank of photographers.